In the age before the introduction of roll-cages and fuel-cells the differences between competition cars and road cars was negligible. Many owners were able to take their road cars out to the tracks in the weekends and be competitive. This win on Sunday, sell on Monday principle was crucial for Aston Martin's business years throughout the company's formative years. 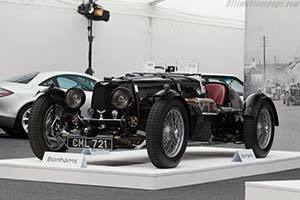 A 1-2-3 class victory for the works team at the 1934 Ulster Tourist Trophy at Dundrod inspired the Feltham based company to name their new high-performance model after the event; the Ulster was born. The Tourist Trophy victory was scored by the latest 'Team Cars', which were distinctly different from the cars by Aston Martin just a few months earlier at Le Mans. The 1.5-litre engined machines were rebuilt with revised chassis that no longer featured the lightening holes used in the French endurance classic. The 1934 Ulster Team Cars boasted production-derived suspension with slightly stiffer springs to cope with the stresses of racing. Sizeable cable-operated drum brakes provided the compact racers with plenty of stopping power. Also derived from the regular Aston Martin production models was the 1.5-litre, four-cylinder engine. The sophisticated single-overhead camshaft unit had been used with great success for several years and by 1934 produced around 80 bhp. It was mated to a proprietary four-speed gearbox. The rolling chassis was clothed with a slippery aluminium body, which included a cowled radiator. The shapely tail of the car housed both the fuel tank and the spare wheel. Despite the sturdy chassis, the Ulster Aston Martin tipped the scales at just 940 kg. Following the success in the Tourist Trophy, which saw the three Team Cars entered finished 3rd, 6th and 7th overall and 1-2-3 in class, Aston Martin set about producing a new series of competition cars for 1935 as well as a series of Ulster replicas for customers. Priced at a startling £750, the privilege of owning an Ulster did not come cheaply. Despite the relatively modest size of the engine, these Aston Martin racers proved very capable and could reach speeds of over 160 km/h. It is believed that Aston Martin produced a total of 21 Ulsters and a further seven Team Cars, in 1934 and 1935. Remarkably all of these are understood to have survived and they rank among the most sought after of all pre-War Aston Martins. Noted British collector and Pink Floyd drummer Nick Mason likes them so much that he has three different examples in his collection.